KUALA LUMPUR: DRB-Hicom Bhd’s Datuk Mohamed Hazlan Mohamed Hussain will take over the helm of the financially stressed Prasarana Malaysia Bhd after its former chief executive officer (CEO) Masnizam Hisham’s tenure has been cut short by the ministry of finance (MoF), according to sources. Mohamed Hazlan, 53, is currently DRB-Hicom’s director of organisational support. However, he is not new to Prasarana. He was with Syarikat Prasarana Negara Bhd between August 2009 and March 2012. His last position was group director of commercial division when he left the public transportation company. Mohamed Hazlan’s appointment is expected to be revealed soon. “The new CEO’s main task [in the immediate term] will be to restructure Prasarana, particularly the company’s debts. Its finance costs are very high. “Prokhas [Sdn Bhd] could be stepping in to help [on restructuring],” a source told The Edge Financial Daily. Prokhas is an in-house restructuring outfit wholly owned by the MoF. Prasarana is another wholly- owned unit of MoF that has fallen into deep financial trouble. It has not even been able to generate sufficient cash flow to sustain its ongoing, besides the accumulated, losses. High finance costs have been straining the public transportation operator. Prasarana posted a net loss of RM2.47 billion, of which RM1.06 billion was finance costs, for the financial year ended Dec 31, 2017 (FY17), compared with RM2.11 billion in FY16. Its finance costs soared 64.5% in FY17 from RM643.62 million the year before. Its annual revenue came in slightly higher at RM846.35 million in FY17 versus RM835.9 million in FY16. However, the revenue earned was not enough to cover its direct cost of RM719.27 million plus staff cost of RM614.46 million for that year. Prasarana is the asset owner and operator of Ampang and Kelana Jaya light rail transit (LRT) lines, KL Monorail, Klang Valley mass rapid transit, bus operations in the Klang Valley and Penang and the cable car services in Langkawi. Last Friday, Masnizam announced through a Facebook post on Warna Prasarana page that she was leaving the company, barely eights months after she was appointed to lead the government-owned firm in January this year succeeding Datuk Seri Azmi Abdul Aziz, whose term ended on Dec 31 last year. Yesterday was Masnizam’s last day of service. Masnizam was quoted by a local daily last week that she did not tender her resignation, instead her contract was cut short without any reason given by MoF. “My contract was cut short. That is what the letter from the MoF says. There was no reason given,” she was quoted by the a local daily as saying over the weekend. Masnizam did not respond to The Edge Financial Daily’s message that was sent to her last Thursday to seek clarification on her departure. 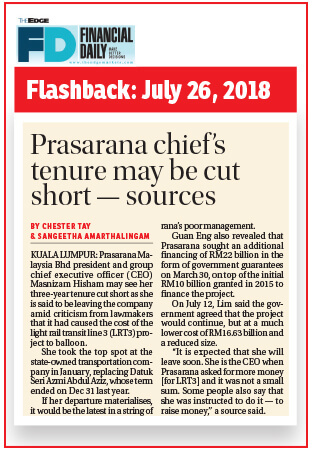 Her Facebook posting has confirmed the report by The Edge Financial Daily on Jul 26 that said Masnizam’s three-year tenure could be cut short due to severe cost overrun of the LRT3 project. To recap, on July 10, Finance Minister Lim Guan Eng revealed that the estimated total cost of the LRT3 project had spiralled more than three times to RM31.45 billion from the original estimate of RM9 billion when the project was launched in 2015. Due to the sharp rise in project costs, according to Guan Eng, Prasarana sought an additional financing of RM22 billion in the form of government guarantees on March 30, on top of the initial RM10 billion granted in 2015 to finance the project. On July 12, Guan Eng said the government agreed that the project would continue, but at a much lower cost of RM16.63 billion and at a reduced size. However, Prasarana’s board of directors issued a statement then to deny Masnizam’s tenure was to be cut short. The board said that it had “full confidence” in Masnizam, and her leadership in running the company, and various initiatives she had undertaken since taking office on Jan 18 this year. “The board also expressed regret with reports by media which the board felt were mischievous and uncalled for, especially authoritative source was not disclosed and when various transformation measures were being undertaken in the interest of the group especially on the much highlighted LRT3 project,” the statement read. In the farewell message to Prasarana’s staff last week, Masnizam said she wanted to thank the MoF for approving issuance of bonds to enable the company to pay employee salaries for September and the next few months. “At least, I did not leave Prasarana group without certainties of staff’s salaries,” she said. Masnizam said when she took over as Prasarana CEO, the company’s cash flow was only sufficient to sustain for three months. She said the company had undertaken several initiatives to control costs, and had resulted in a cost saving of RM175 million as at July this year, and it was possible for Prasarana to narrow its losses by RM200 million by the end of the year.